King Midas is not the only one with a penchant for turning things into gold. 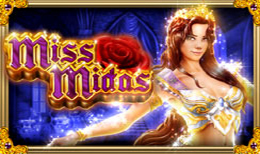 It’s unknown whether Miss Midas is the daughter, sister, mother, or love interest of the King but she definitely has the Midas touch in this 5 reel online slot game. Enjoy the enthralling golden graphics of this slot game and match up golden, royal thrones, red roses, and fruit bowls to transform your wealth now. NextGen Gaming was founded in 1999, and prides itself on the new game play elements it has created for its online slots games as they focus on giving players a more personal experience. This games developer has become one of the most reputable casino software developers in the industry, and is known for providing profitable, entertaining and visually stunning games. Keeping up to date, their games are mobile ready and have made a success with the social network platforms winning awards for their play-for-fun Facebook slot side. King Midas was a figure from Greek mythology who was blessed (or cursed) with a special gift, everything he touched would turn into gold. Miss Midas floats in front of you like a Greek goddess with the power to turn everything into gold, something she enjoys doing if you would like to give her the chance. She is a sultry protagonist who lives in a mysterious world where all the characters are vibrantly coloured and all the riches sparkle. This 5 reel, 25 payline, fantasy inspired online slot game can be played for 25p up to £100 per spin, giving everyone the chance to win some gold. Decorating the reels are your classic card playing symbols, they may be low in value but they are richly designed. You have other high value symbols such as the Red Rose, a Bowl of Fruit, a Throne and a Peacock. Miss Midas herself is the Wild symbol and she only appears on the 3rd reel, however 2 – 5 symbols will give you 5 to 500x times your stake. She may also trigger the Golden Touch feature where she will turn adjacent symbols into gold. The Scatter symbol is a beautiful view of the palace and activates one of the bonus features. If you land 3 Scatters you will receive 15 Free Spins, 4 will give you 20 Free Spins and 5 will reward you with 25 Free Spins. The Golden Touch feature can be triggered during the Free Spins games, and you can trigger further free spins by landing 3 or more Scatter symbols. Miss Midas also features a Gamble Feature by clicking the Hearts/ Clubs button below the reels after a winning spin. You will then be able to play a game of double or nothing. You will be dealt a card and you have to choose if it is red or black to double your winnings, or choose the suit to quadruple your winnings. If you guess incorrectly you will forfeit your bet, and you have a limit of 5 successful guessed. Miss Midas has that golden touch when it comes to charming your heart, the game is as beautifully designed as the lady herself, with stunning graphics that are rich and vibrant. You have some exciting bonus features that fit in with the theme of the game, and some classic ones too. What’s more is that the betting range is wide enough to attract all levels of players, which is brilliant because this an online slot game you wouldn’t want to miss.